In order for this to work you need to have your nameservers pointed to Onyx and have connected your domain. 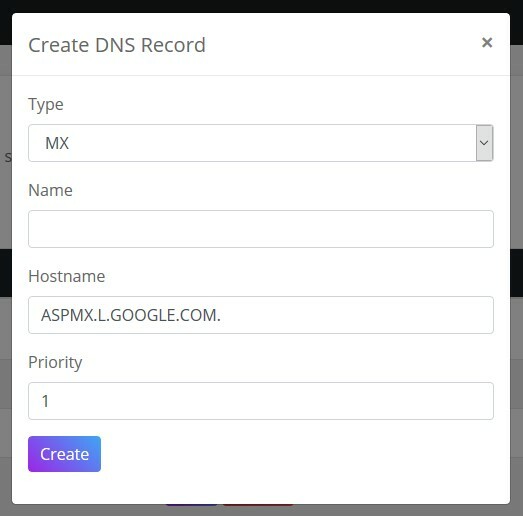 The first article linked above also details how to add DNS entries in the Onyx DNS tool. Once you’re on the DNS Tool for your domain, we are going to add the records provided by Google on their website. We have reproduced their values here but please note they reserve the right to change these values at any time and we always recommend you seek the most up-to-date values from Google’s own help website. You will need to create an individual entry in the DNS tool for each of the rows above. The screenshot below is an example of how the form would look with one of these values entered. Once you created one record, add a record for each other MX records in the table above. After all records exist in your DNS tool it will take anything from 1 hour to 72 hours for these values to propagate and for email to flow through to your G Suite hosted email service.